As an executive, you need an authoritative resume, so take advantage of our free downloadable and customizable resume samples. 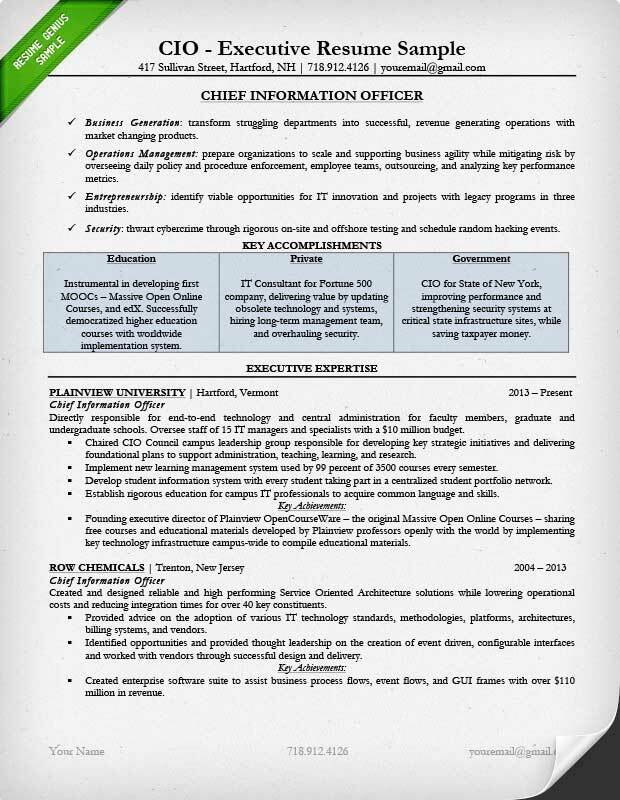 We provide a Chief Executive Officer resume (below), a Chief Information Officer resume, a Chief Technology Officer resume, and writing tips for each. Entrepreneurial and driven Chief Executive, with 20 years of leading industry expertise in founding numerous companies in domestic and international marketplaces. Facilitator and builder of world-class technology management and product development teams, with specialty in both start-up and scaled growth stages. Proven fundraising and networking skills, building fruitful partnerships with hundreds of clients and delivering multimillion-dollar bottom-line growth. Grew Century Industries revenue from $6 million to $10.4 million and personnel from 50 to 250. Expanded market share for Intraserve, Inc. data access service from 30 percent to 45 percent over two years, increasing profit margins by 40 percent, with higher quality services. Founded CloudOne with two other co-founders with highly profitable exit. Provide visionary leadership for $10.5 million technology company offering cloud-based Platform as a Service (PaaS) for natural gas industry in the Midwest. Determine strategic direction and spearhead technological integration for array of services platforms to ease database burdens on labor intensive gas companies. Lead long-range planning with industry leaders, product management, and software development processes. Oversee web browser, mobile app, terminal emulator technical development. Present field demonstration for products and connect with natural gas executives in North Dakota, Colorado, Oklahoma, and Texas, resulting in high sales and 30 percent command of market share in three years. Grew personnel from 50 to 250 and delivered revenue growth from $6 million to $10.4 million. Brought on to deliver and manage market growth for cloud and logistics consultancy firm for warehouse industry companies. Spearheaded overhaul of numerous departments and focused on recruiting key market players, while providing functional management and establishing performance metrics. Determined profit impact of market strategies (PIMS) of existing products and advised on the creation of higher quality products with quicker go-to-market implementation. Implemented high-quality product development with designated sales pipelines. Advised on balancing short-term and long-term holding strategies to maximize foothold in dynamic technology market. Oversaw the development of a new line of higher quality services by hiring a team of technologist and experts to guide new product development, resulting in fully integrated team with products as new core business. Expanded market share from 30 percent to 45 percent in two years, and increased profit margins by 40 percent. Co-founded specialized Quality of Service (QoS) Platform for various local business using emerging cloud-based PaaS business model with clients across North America and Central America with $35 million in total revenue. Oversaw product development, including software development lifecycle and implementation, testing, and QA. Directed all operation for service outreach and product demonstrations. Designed and led development of a highly scalable, distributed, cloud-service platform, utilizing Service Oriented Architecture (SOA). Built eight service centers in Canada, US, Mexico, and Panama to process large amounts of client data. Successfully negotiated exit with Amazon Web Services in early 2010 for over $50 million. We recommend that your resume be two pages. However, in some circumstances, a three-page resume is acceptable. 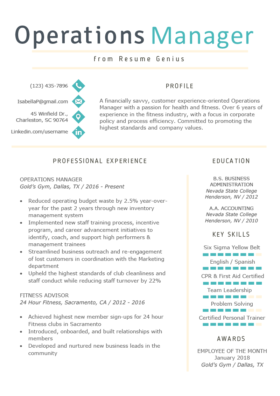 Write a standout resume introduction. A resume introduction will be similar to a persuasive elevator pitch to hiring managers. Achievements must be highlighted in the first part of your resume. As an executive, your achievements will be under scrutiny. Make sure they stand out. Your skills must be concise and informative. Try to put your skills in distinctive sections tailored to your targeted position. As a CEO, you are at the helm of an entire organization and guide the long-term performance of your enterprise. Responsible for the fiscal and operational performance of the company, you report to a Board of Directors. In this capacity, you will act as the figurehead and leader for all internal operations and are the public face of the company. You are strongly focused on the overall growth, expansion, and financial health of the organization you serve. You are organized, methodical, and decisive, with a proven ability to correctly read the market you operate in. Your task — and it’s not a simple one — is to translate and compress your numerous achievements and skills into a two to three-page resume. To the greatest extent possible, you need to come up with the most relevant examples of these traits to include in your resume. The first part of any executive resume should be broken down into three distinct sections. This candidate knows the first section of their resume is the most important section. They have made a visible, balanced, and exceptionally eye-catching header. Their professional title is large and easy to see. Indeed, this resume instills confidence fit for a CEO. The Resume Introduction, also known as the Career Summary, is a snapshot of a candidate’s career that is compelling, informative, and concise—like an elevator pitch. As the first impression of the entire resume, the summary is specifically written to increase reader interest and entice them to analyze the resume deeper. This is the model professional summary for an executive resume. It is concise, focused, and error free. Yet this powerfully written section does not reveal too much information too soon, making a great case for the interested hiring manager to examine the rest of the document. Your achievements should be highly visible with their own section. In this section, you will need to convince a hiring manager that you are capable of delivering numerical growth in the role. One of the best ways to demonstrate this is by quantifying your past achievements. Actually, this is easier than you think: we have an easy to implement a formula that will help you quantify your achievements. This simple and effective formula is a win-win: it simultaneously buttresses a powerful career summary and builds even more interest in the hiring manager. This section supports both the career summary and demonstrated achievements sections by adding much-needed scope in the form of keywords. The candidate strategically chose keywords that would condense his essential skills into 12 check marks, which helps a hiring manager quickly grasp his core abilities and also help his resume pass Applicant Tracking Software (ATS). Aesthetically speaking, the section is visually appealing and lends order to the document’s style and formatting via three columns of uniform proportions. The first section of the resume is the most important part of the resume. Make sure to check out our How To Start A Resume Guide. Business Generation: transform struggling departments into successful, revenue generating operations with market changing products. Operations Management: prepare organizations to scale and supporting business agility while mitigating risk by overseeing daily policy and procedure enforcement, employee teams, outsourcing, and analyzing key performance metrics. Entrepreneurship: identify viable opportunities for IT innovation and projects with legacy programs in three industries. Security: thwart cybercrime through rigorous on-site and offshore testing and schedule and random hacking events. CIO for State of New York, improving performance and strengthening security systems at critical state infrastructure sites, while saving taxpayer money. Directly responsible for end-to-end technology and central administration for faculty members, graduate and undergraduate schools. Oversee staff of 15 IT managers and specialists with a $10 million budget. Chaired CIO Council campus leadership group responsible for developing key strategic initiatives and delivering foundational plans to support administration, teaching, learning, and research. Implement new learning management system used by 99 percent of 3500 courses every semester. Develop student information system with every student taking part in a centralized student portfolio network. Establish rigorous education for campus IT professionals to acquire common language and skills. Founding executive director of Plainview OpenCourseWare – the original Massive Open Online Courses – sharing free courses and educational materials developed by Plainview professors openly with the world by implementing key technology infrastructure campus-wide to compile educational materials. Created and designed reliable and high performing Service Oriented Architecture solutions while lowering operational costs and reducing integration times for over 40 key constituents. Provided advice on the adoption of various IT technology standards, methodologies, platforms, architectures, billing systems, and vendors. Identified opportunities and provided thought leadership on the creation of event driven, configurable interfaces and worked with vendors through successful design and delivery. Created enterprise software suite to assist business process flows, event flows, and GUI frames with over $110 million in revenue. Oversaw the strategic management and direction of the state’s Information Technology (IT) resources and network infrastructure, focusing on network security, talent management, conducting benchmarking exercises. Responsible for establishing and implementing strategic plans, policies, standards of IT architecture while minimizing labor overlap. Coordinated the activities of Agency Information Officers (AIO) to integrate statewide technology initiatives and ensuring compliance with policies and standards. Implemented centralized communication channel to deliver clarity within the department and create a sense of common purpose throughout a massive statewide organization. Spearheaded several public infrastructure anti-hacking projects in conjunction with the Department of Homeland Security based on threat identification, scenario building, and oversaw multiple ‘attacks’ from counter-terrorism units. Assisted in the development of go-to-market software systems and product management for GDR routers and developed core architecture for the IOS XR software product line. Discovered opportunities and presented solutions that increased revenues over $13 million per year. Drove Software Development Lifecycle (SDLC) process improvements, evaluated, and adopted CASE tools to reduce delivery times, and improve oversight, quality, and maintainability of systems. Represented the company on industry standards committees (ATIS, TCIF) and played key roles in creating and defining industry standards. As a Chief Information Officer (CIO), you are the chief technical executive of an organization, responsible for the performance of the ‘server’ side of technical operations. You build and maintain the technical means to achieve all company goals. You not only oversee the entire IT department but are also a business leader. You work closely with the CTO, CEO, and other upper management personnel to design programs that successfully produce revenue-generating architecture. You are an expert technical architect and often feel equally at home in administrative, engineering, and business environments. You are a skilled facilitator of talent, able to harness teams to believe in their vision and forge new pathways and products. With years of experience over a long career, writing a CIO resume can be a challenge. What should you leave in, and what should you leave out? Here is an excellent sample to help guide the process. Keeping a hiring manager’s interest while imparting professional, factual content is the paramount goal for any resume. The resume sample has a strong ability to maintain a reader’s interest over the course of the entire document. Section by section, this CIO’s resume instills a sense of professionalism and trust that this client will be a strong fit in an executive role. This candidate begins by offering excellent descriptions of their four key areas of strength: Business Generation, Operations Management, Entrepreneurship, and Security. Notice how the candidate doesn’t deliver the summary as block text, but in separate sentences. This formatting style helps readers properly digest new information. There is another benefit to this format style: its clarity demonstrates her eye for detail and logic — after all, would a hiring manager ever hire a sloppy executive? Don’t be shy about your achievements – this your time to shine. The candidate successfully showcases the breadth of their experience in three different fields: education, private, and government in a clear and concise manner. These passages show the candidate has a history of building successful ventures that also have a social impact. This is the content quality you expect from a CIO. These two opening sections are an excellent way to begin a resume. Engaging content and clean format will convince a hiring manager to decide to read the rest of the resume. At this point, the candidate has done a great job of building interest. Now hiring managers will want to know more about this person — next, she has to complete the sale. First things first: begin each sentence with an action verb. Action verbs are the building blocks of your work experience and are helpful in transforming your executive resume into a powerful document. A massive list of action verbs can be found here. Remember to keep your resume in present tense for your current positions and past tense for previous positions. Bad grammar is a resume sin. Implement, identified, and discovered are great action words. The candidate uses an appropriate action verb that allows the hiring manager to know exactly how the candidate approaches a problem and solve its challenges. Don’t just provide a long list of duties you performed, add detail and quantify your duties with numbers. Whenever possible add data to your bullet points. Just as important, you will need to make your quantified information match the requirements and scope of your targeted job. The candidate has kept the hiring manager’s interest up to this point, but they still have one last challenge. CIOs need to include technical skills in their resumes. They undoubtedly know more skills than listed, but they have strategically chosen to keep the section targeted, informative, and to the point. The formatting of this candidate’s section actually invites the reader to navigate through each domain of expertise. Don’t “skill dump”. Delivering a cascade of technical information will alienate even the most technically advanced hiring manager, and it will seem like you haven’t targeted your resume for the job. As you write your executive resume, try to adopt some of this sample’s strengths into your own resume. If you implement these tips into your own resume, we guarantee you’ll generate more interest and land more interviews. Innovative Career Technologist with over 15 years’ experience delivering creative, client-centric tools, with value-driven solutions. Proven leadership experience ranging from evaluating technology to discovered niche products for bootstrapped and venture-backed startups. Highly data-driven, committed to designing coherent enterprise platforms with a wide range of technical domain expertise and business acumen. Entrepreneur and founder of successful technology startup showcasing ability to drive change through consensus within an organization. Oversee all product development for venture-backed startup focused on delivering modern virtual reality headsets, mapping, and simulation products. Responsible for delivering 15 products in less than two years with proven revenue growth of over $300 million. Connected with former teammates at Google and US Army to land lucrative contracts worth over $100 million. Decreased product time-to-market by 35 percent by implementing Service Oriented Architecture (SOA). Deliver numerous training modules and presentations by collaborating with top engineers from key clients including Google Maps, US Army (explosive disposal training), Weather Channel (weather simulation), Emirates Airlines (flight simulation training), and USC School of Architecture (virtual walkthroughs). Determine strategic direction of product development and uphold the company’s position at the forefront of technology by focusing on product content and user design. Manage application development, business intelligence, and business analysis teams. Troubleshoot and correct complex issues with an emphasis on real-time and historical data rendering. Manage 25-30 department personnel including the Director of Development, the two Senior QA Engineers, Head of Network, and Lead Project Manager. Responsible for strategy development, solution design, production execution, software integration and client relations for technology firm offering revolutionary self-editing video technology. Responsible for overseeing team to produce world’s first self-editing video using machine learning technology, resulting in numerous patents. Instrumental in numerous successful business and product technology presentation at Series-A fundraising meetings with numerous private and institutional investors – with over $15 million raised. Oversaw business performance for products, software and hardware purchases and research and development. Operated as the principal bridge for product development teams, CIO, CMO teams. Reviewed all development projects to ensure reliability, effectiveness, and ROI. Led Quality of Service platform (QoS) engineering and ensure optimal bandwidth for large video files. Created development, quality assurance, and implementation methodologies, processes and teams highly aggressive business and original equipment manufacturing (OEM) goals. Technical Architect for cost cutting online videography tool with over 2 million users. Enabled AdNext to drive innovation, development, and management of voice, video, data products. Contracted to Telwares as Video Architect for broadcasting companies with over $41 million in annual revenue. Led team in the design and sourcing of a fully meshed video architecture providing standards-based environment with reduced operations and maintenance complexity. Enabled news and sports provider to be agile in response to changing marketplace demand and to cost effectively manage collaboration needs. Co-authored “Global Video Centralization Strategy” to address all video editing issues. Defined strategic direction and tactical oversight for operations and sales management, as well as product development and management. Grew business by creating a strong product suite; positioned the company as an acquisition target and successfully negotiated sale to AdNext. Conceived, architected, and managed development of professional grade videography support systems. Wireshark; LAN; WAN; MAN; MPLS; IPVPN; Ethernet; TCP/IP; Firewalls; DHCP; DNS; LDAP; Active Directory, RADIUS. Working knowledge of OLTP and OLDB; relational databases including SQL, MySQL, PostgreSQL, and MS SQL; and non-relational NoSQL databases including Key-value, Column, and Object based. Public, Private and Hybrid Cloud Solutions. Amazon Web Services; Microsoft Azure; IBM SoftLayer; VMWare; OpenStack. MS Excel and MS Visio Power user; Proficient with MS Word, PowerPoint, and Project; Office 365; Google Apps; Atlassian Jira. A Chief Technology Officer’s (CTO) role is to create and innovate. You are a technology pioneer responsible for ensuring a company is making great products for their customers. You are the driver behind the commercialization of technology. You develop coherent platforms backed up with useful features on a variety of digital channels. Your importance in companies is rising due to the fact that users are demanding increasingly sophisticated products. You are business intuitive and contribute cost-effective solutions to your creative architectures. A proper executive resume for these roles needs to showcase the candidate’s ability to implement change across an organization, successfully champion its products, build strong connections in the tech industry, and genuinely understand what its users want. Every resume is subject to a quick “eye-test” – a quick glance-by-glance evaluation of your resume. As a first impression, the test goes a long way in making or breaking your candidacy. So which factors help you pass this challenge and invite a hiring manager to read your resume? According to our research, hiring managers spend an average of 6-30 seconds evaluating a candidate’s resume. It’s crucial to win over the hiring manager in those first moments. A core competency section is a key foundation in helping you pass this test. The candidate’s core competencies are comprised of a dozen skills optimized to their targeted position. This is a clean representation of the candidate’s core skills. A hiring manager will able to quickly ascertain what skills the candidate brings to the table — provided those skills are targeted for the job. The faster you can convey relevant skills to the hiring manager the better your odds of passing the “eye test”. 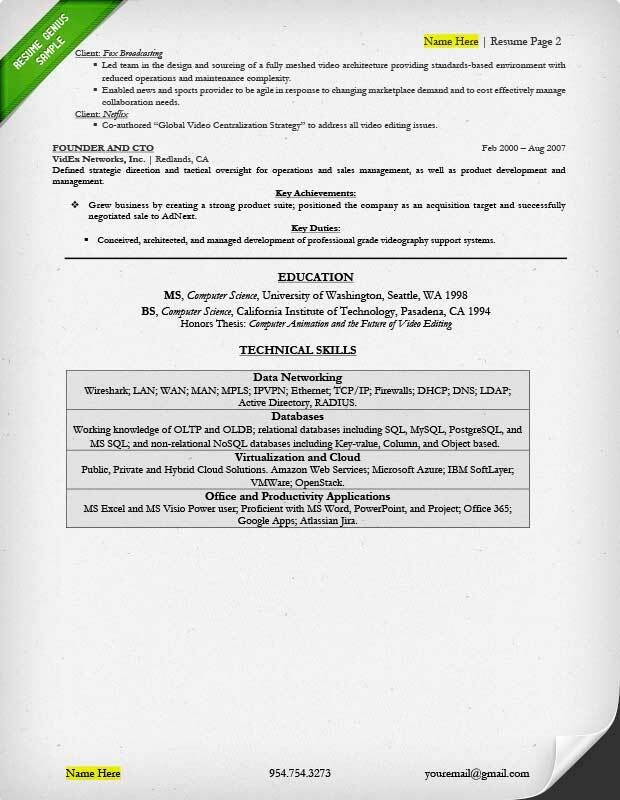 This candidate’s resume includes numerous sections of quantifiable data that show they are ready for a new challenge. Take for example the line, “Responsible for delivering 15 products in less than two years with proven revenue growth of over $300 million.” This accomplishment provides data to back up the claim that he is a successful CTO. Fill your resume with pertinent, quality data to give the hiring manager a look into the scope of your previous roles. Other examples of quantifiable data can be given via revenue and growth numbers, the number of personnel managed and/or products delivered, or any other type of numerical metric. The statement is powerful enough even without numbers. You need to place emphasis on your achievements in your resume to get results on the job market. This executive resume sample has effectively showcased the candidate’s impressive achievements in the work experience section. For example, this sample includes their key achievements before their key duties. By doing so, the candidate immediately asserts their results-driven work style, rather than duty-bound work style. Also, the font of the key achievements section is slightly larger than the key duties section. The two sections also use different bullet point styles. All of these formatting choices help draw the hiring manager’s eye directly to their achievements. See the sample below. This is a highly achievement-oriented way to build your resume. By stating achievements before duties, the candidate knows that a hiring manager will be even more interested, impressed, and focused on their key duties. Resume formatting has one purpose: to make your work experience readable and memorable. Putting in some effort into your formatting will give the hiring manager a positive opinion of your candidacy – “Wow this person has their act together!” Odds are, the hiring manager will carry that positivity over into the interview. 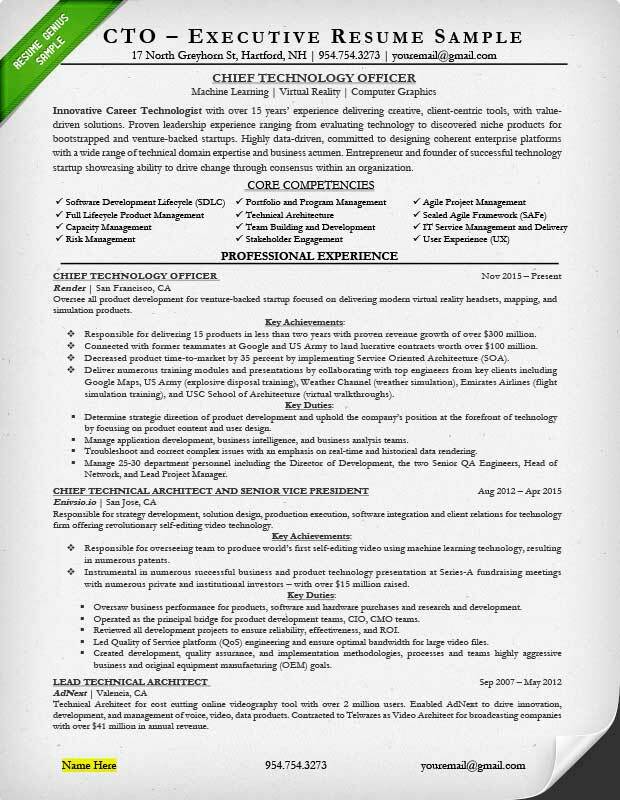 The candidate’s resume is a good example of clear and strategic formatting for the following reasons. The resume is divided into four distinct sections: name and information, resume introduction, professional experience, and education and technical skills. Clear sectioning is essential for readability. The consistent use of italics and bolding, left/center/right alignment, and font size makes it easy for a hiring manager to quickly assess your resume. Make sure you keep your job title, company name, dates, location, and work experience in their respective formats throughout the resume. Before you begin writing your resume, try to start off with a rough idea of what your end document will look like. Taking time at the beginning to decide on an overall resume structure will make it much easier to write a coherent resume.